The hardware in my Samsung Epic 4G is incredible. Super Amoled screen, keyboard, quick 1GHz Hummingbird processor and 4G. In fact, most owners of any of Samsung’s Galaxy S Class phones (including Epic 4G, Fascinate, Vibrant, Continuum and Captivate) love their “tech”. Google did select Samsung to build their newest Nexus phone after all, and Samsung has sold over 10-million Galaxy S Class phones making them the top manufacturer of Android phones. 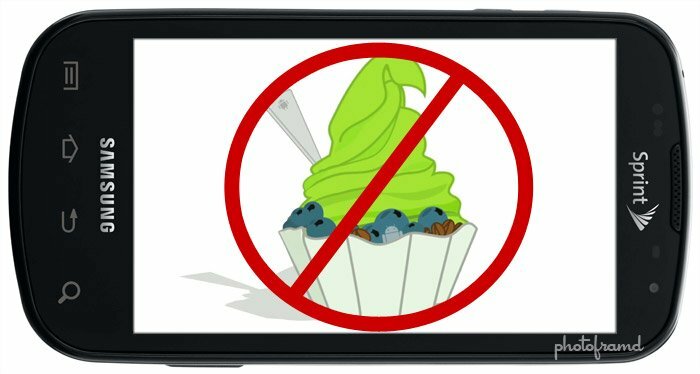 @GalaxySsupport – We’re working to make the Android 2.2/Froyo upgrade available to all U.S. Galaxy S owners as soon as possible. @GalaxySsupport – We want Galaxy S owners to have simple/reliable upgrade. We are running tests due to complexity/unique functionality. After repeated disappointments and broken promises, Galaxy S owners are now taking action. Several sites have reported a pending class action against Samsung and T-Mobile over the Samsung Vibrant. This phone has been plagued with GPS problems since its introduction and Samsung’s attempted fixes have failed. Electronista.com reported that the class action accuses Samsung and T-Mobile of “violating the Uniform Deceptive Trade Practices Act for promising an update in the short term but delaying to the point where the Vibrant 4G would ship with the OS already onboard. The two companies hadn’t lived up to promised fixes and was saving them for a new model.” Basically, forcing existing owners into purchasing the new Samsung Vibrant 4G to get a working GPS as well as the Android 2.2 update (as reported by Androidspin.com). Samsung Mobile does not comment on rumors or speculation. With regard to the Froyo update, we recently issued the following statement: “Samsung feels it is important to make the Android 2.2/Froyo upgrade available only after we feel that we can give the millions of U.S. Galaxy S owners a simple and reliable upgrade experience. Due to the complexity and unique functionality of each Galaxy S device, we are performing additional testing and are working to make the Android 2.2/Froyo upgrade available to all U.S. Galaxy S owners, including the Samsung Vibrant, as soon as possible. Samsung is not charging carriers for Froyo updates to Galaxy S. We hope to have more detail on status shortly. Promise! The Android platform sits on top of Linux OS. As a result, Linux programmers have been very successful at gaining Administrator access to these phones “to root” them and implementing custom modifications. In fact, these ambitious programmers have been able to flash their phones with various Android upgrades, even the newest Gingerbread! These actions will void your phone’s warranty and there is the possibility to turn your shiny phone into a plastic “brick“. Still, there are many Galaxy S owners who swear by it. For the Samsung Epic 4G, some of these ROMs are called CyanogenMod, Nebula Rom, TrulyEpic and ViperRom. AndroidCandy.com maintains a list of Epic 4G Roms. And, these programmers take great pride in their work, issuing weekly enhancements and bug fixes. Shame Samsung is not as responsive! These ROMs have customized interfaces, animations, sounds on top of the Android 2.2 update. If you are interested, AndroidCentral.com has a detailed step-by-step for installing a ROM called TrulyEpic Rebirth. Also, there are several videos on YouTube which demo the most popular custom ROMs. In fact, RandyShear has a YouTube Channel with over 25 different ROM tests for the Epic 4G. Just take a look at his video for the ViperRom to understand the “rooting” and “flashing” process for the Samsung Epic 4G. Based on his comments, Randy likes the performance of the ViperROM the best. TeamVIPER has released frequent updates and just launched a dedicated site, forum, chat and even a support ticket service. Samsung should have such dedication to their phones! No news creates a vacuum of discontent. It’s amazing that a global technology leader like Samsung would treat its loyal customers in such a fashion. Samsung needs to come clean and explain exactly why these updates have not been issued in the US. It is possible that the pending Android updates force a complete wipe of all data on these phones (contacts, calendar, emails, music, paid Apps, etc.) and Samsung is attempting to avoid this. It is also possible that Samsung’s customized TouchWiz is causing the delay. Either way, Galaxy S owners deserve an official answer. Most importantly, we deserve the Android 2.2 update … and a timely update to Android 2.3! UPDATE January 29, 2011 – Samsung reports record growth in Mobile phones. Samsung’s telecommunications businesses – Mobile Communications and Telecommunications Systems – registered a record quarterly operating profit of 1.44 trillion won for the period, up 38 percent year-on-year. Fourth quarter revenue reached 12.11 trillion won, compared with 10.17 trillion won for same period of 2009. By finishing the year strongly, Samsung achieved full year 2010 operating profit of 4.30 trillion won on sales of 41.20 trillion won for its telecommunications businesses. Driven by strong year-end demand for the company’s flagship smartphones, Samsung’s mobile device sales reached 80.7 million units for the quarter, up 17 percent year-on-year. This brought total sales for the year to 280 million units, registering growth of 23 percent and outperforming the overall market. Although Samsung reported record growth, it is unlikely to continue. The simple truth – how many current Galaxy S owners would purchase another one when the company has clearly failed to support them? What is fair? What should happen? Cellphone owners are typically locked into a 2-year service contract for their phone. The cellphone manufacturer should be required support their phones during that period of time. That support should include software upgrades (like Android releases) which are compatible with the cellphone’s hardware and necessary for proper functioning (like bug fixes for known GPS problems). I believe the only way to guarantee this support is for Google to add a clause to the Android Developer Agreement to force hardware manufacturers to supply timely updates to minimize market fragmentation. (It is unlikely that the Open Handset Alliance which is dominated by hardware manufacturers would agree to such a clause.) Otherwise, it would take an act of Congress to protect the consumer (which also seems unlikely under current political trends).